Christy, Dan and I spent a lot of time together in college. They were my two best friends and pretty much my "parents" during those brutal winters in Rochester. We had a lot of potluck parties, rescues from bug infested homes and random adventuring, eating amazing food (korean food is our fav) and wandering around Rochester and slipping and falling during entrances to stores. It was awesome. Every time Dan would gchat me, I would get really excited and be like, "ARE YOU PROPOSING?!" -- and many, many times I've been disappointed- hahaha... UNTIL! a couple of weeks ago! Dan FINALLY asked me to help him plan out his proposal! So, I made plans with Christy to get our nails done but instead of me picking her up, Dan showed up on her doorsteps and popped the question! It was actually really sweet and a COMPLETE surprise for Christy. It was a really bittersweet moment for me. Dan had gotten a new job at Amazon, in Seattle, and his time in NYC was almost up. So here I am, watching two of my best friends committing to begin their new life together and also knowing that in a few months, they will be married and moving across the nation to the west coast. I was happy and a bit sad, but mostly happy because this is what life is about. Moving on, growing up and reaching different milestones in our life. 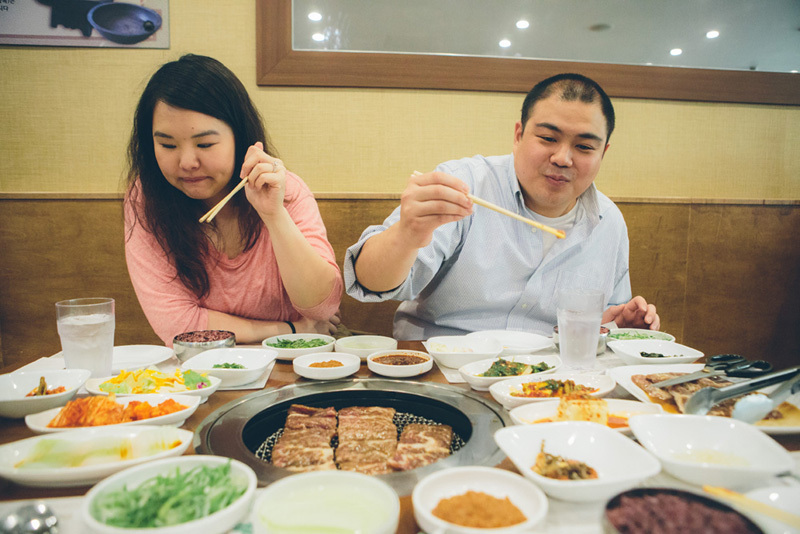 So very fittingly, we went out to celebrate and had some delicious Korean BBQ and also got a few moments to snap a few shots of this happy couple on their big day (until the wedding day)!